Although they are considerably more complicated than manual gearboxes, with control and operating functions in addition to the gears, modern automatic transmissions are less likely to give problems than their manual counterparts. Automatic transmission faults Dipstick Oil Level Mostfaults in anautomaticgearbox arecaused by the oillevel being too low. 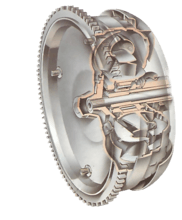 Torque Converter Ifthe torque converteris damaged the carmay not accelerateproperly. Downshift cable Controls the gearbox kickdownfacility. If the cable is damagedor badly adjusted, the gearboxwill not change down when youneed it. Selector linkage If the linkage is badlyadjusted gearselection may suffer. Inhibitor switch Prevents the engine frombeing started in any gear otherthan 'neutral' or 'park'. If it isbroken the engine may notstart or there is a danger of thecar being accidentally startedin drive. Ventilation grille Helps to keep the torqueconverter cool. Make sure itis not blocked by dirt ordebris, otherwise thegearbox may overheat. Because of the large number of parts inside an automatic gearbox, some faults may be caused by more than one component. The first check should always be on the transmission fluid level and its condition — if it is all right, then you will need to check the other points shown here. The main reason for this greater relibility is the fact that the gears are engaged smoothly by the operation of internal clutches and brake bands under automatic control, so minimizing the possibility of maltreatment, shock loading and gear crashing, and the mechanical damage that can result from these. 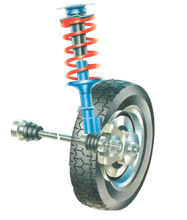 When problems do occur they are often caused by the external control linkages, or a low fluid level, and can often be dealt with without having to strip the transmission. Internal transmission faults generally call for specialist equipment and knowledge and are best left to a service engineer - after you have checked to make sure that the problem really is internal. The close linkage between engine and transmission can make faultfinding difficult, so before you blame the transmission for bad performance you need to check that the engine is in good tune. Bumpy starts and gear shifts, for example, can be caused by a high engine idle speed. If you suspect overheating has occurred, check that the ventilation openings in the torque convertor bell housing have not become blocked with dirt or oil build-up. Clean them out using an engine cleaner and a stiff brush if necessary. Where an oil cooler is fitted make sure the hoses to and from the transmission are properly connected and not kinked. Also check that the oil cooler radiator is not blocked by dirt— clean the core very carefully with degreaser and a soft paint brush. Finally, drain the transmission and refill with fresh fluid. Use only the type of automatic transmission fluid (ATF) recommended by the manufacturer and take great care not to get any other substance in the fluid. By far the most common cause of trouble with an automatic gearbox is incorrect fluid level (see sideline, opposite). If that seems to be all right, you need to do a test to discover whether the problem is in the gearbox, the torque convertor or the engine. A general lack of performance with poor acceleration and bad hill starting can be due to a fault in the torque convertor. With some models it is possible to check the convertor by carrying out a stall test, though this procedure is not suitable in all cases. Find out from your manual (or your dealer) if you can do the test, and also what is the specified stall speed for your transmission. With the engine running and both the engine and transmission properly warmed up apply the footbrake firmly, select the lowest gear and fully depress the accelerator pedal so that the engine revs up - keep it going until the revs stop rising. Using an accurate rev counter, make a note of that engine speed (called the stall speed). Release the accelerator and return the selector to neutral. Do not hold the transmission in the stalled condition for more than ten seconds or you may cause serious damage. Compare the measured stall speed to the specified value. A reading just below the specified value means that the engine is probably out of tune, but a significantly lower reading (say 500rpm down) shows that there is a convertor fault. A high stall speed points to a problem with the fluid supply to the convertor, or to an internal fault in the rest of the transmission. To find out exactly where the problem lies, you will need to do the tests shown in the faultfinder chart below. Automatic transmission fluid This fluid has beenoverheated. This fluid showsinternal wear. First check the fluid level. A need for frequent topping up shows that there is a leak somewhere in the transmission which should be traced and put right as soon as possible. Try standing the car over some newspaper laid out on the ground. Start the engine and operate the transmission lever a couple of times. Any drips will show up on the paper and their position will give you a good idea where the fluid is coming from. If the level is all right, you should check the fluid condition. The condition of the transmission fluid can often provide a useful guide to transmission condition. Put a smear of fresh fluid on some white kitchen paper to give a comparison and then use the dipstick to obtain a sample of the fluid from the transmission, again smearing it on paper. Hot fluid is thinner and will have a less pronounced colour but the two samples should appear much the same. Dark brown discoloration shows that the fluid has been overheated, while the presence of black specks points to heavy wear of the internal clutches and brake bands and an internal investigation will probably be needed — especially if your other tests show the transmission is not working properly. Check where the adjuster it, here it is under the bonnet. On some cars, the parking brake is operated by a separate cable from the rest of the gear selector linkage. It must be correctly set or the brake may not work. Use a spanner to adjust the length of the cable. Find out from your workshop manual where the adjuster is—it may be at the gearbox or somewhere under the bonnet. Select 'park', then adjust the cable so that the parking brake pulls on. Then select neutral and check that the parking brake releases. You can do this by gently trying to push the car in each position. Pull the on the throttle linkage to check that the cable moves freely. The downshift cable, or in some cases linkage, provides the transmission with information about the accelerator pedal position which is used to adjust the speeds at which gearchanges occur. Check for free movement of the cable by manually operating the throttle linkage. The cable should move up freely and return without kinking. If the movement is not free check along the outer cable to make sure it is not kinked or squashed. If necessary, adjust the cable by turning the adjusting screw. Pull on the cable itself to check there is a resistance to movement— if it pulls up freely with no resistance it is broken or has become disconnected in the gearbox. There should be a small amount of free movement in the throttle linkage before the cable, or linkage, comes into action. You can make minor changes in the cable setting by releasing the locknut and using the adjusting screw. Make only small changes and check the effect by road testing. Use a test lamp to check that there is a power supply to the inhibitor. Most automatic transmissions are fitted with an inhibitor switch which lets you start the engine only when the transmission is in the 'neutral' or 'park' positions — often the switch includes an additional set of contacts for the reversing lights. Failure of the switch, or the associated wiring, will mean that you will not be able to operate the starter. However, before you check the switch, try to start the engine in all the control lever positions because the problem could lie with the control linkage. If the starter will operate in any position other than 'park' and 'neutral', the linkage needs adjusting. Common positions for the inhibitor switch are on the transmission housing (close to the selector lever); at the end of the cable-operated control linkages (in front-wheel-drive cars); and by the side of the control handle inside the car. Using a test lamp check that there is a power supply to the inhibitor switch when the starter is being operated — you will need someone to help with this. Some switches are adjusted by screwing them into or out of their mounting. Then see if power appears on the output side of the switch when the selector lever is in the 'park' or 'neutral' position. If it does not, the switch needs adjusting or replacing. With some transmissions the switch can be adjusted by releasing a locknut and screwing the switch assembly into, or out of, its mounting. Other types are adjusted by sliding the switch into the correct position. Where the switch is by the control handle, adjustment is generally made by releasing the contact assembly mounting screws and sliding the assembly into a new position. After making any adjustments check that the starter will only operate in 'park' and 'neutral'. If you cannot get the switch to work by adjusting it, you will have to fit a new one. Disconnect the control linkage at the transmission lever. Incorrect alignment of the linkage between the control lever and the transmission can cause a variety of problems such as an inability to start the engine or to engage drive. The precise method of adjustment varies with the type of transmission and the linkage design but the normal procedure is to disconnect the linkage where it connects to the selector lever on the transmission. The lever on the transmission and the selector inside the car are set to the same control position, generally 'drive' or 'park', and the linkage alignment checked. The end of the linkage should line up exactly with the mating part of the selector lever. If there is any misalignment you can adjust the linkage, usually by screwing a threaded member in or out. Then reconnect the linkage and check for proper operation. The linkage adjuster may be at the control lever end, in which case you generally gain access by removing the rim round the base of the control lever.